Over on the nominations page, one of the nominations has a large comment discussion about this. Some of us have been hoping that the person who originally brought up the concern would bring the discussion to meta, but it doesn't look like that's going to be happening, and it seems worth discussing not only on its own merit, but because one particular nominee has received some negative attention over the issue. There is no guarantee the Googled answer is right. I've seen one of the major Google answer people give a wrong answer before. There is no guarantee that the site the answer was found on has a license permitting the content to be used here. People who write FAQs for GameFAQs tends to explicitly forbid this sort of thing. "Google answers" suffer from "answer rot." Similar to "link rot," "answer rot" is when the answer becomes wrong but is never fixed. A Google answer to a world-of-warcraft question could be wrong as of any update. Every question asking about quests or leveling paths in WoW were made wrong by the releast of the Cataclysm expansion in December 2010, due to major changes to the game's zones and game mechanics. I understand something like this also happened in the more recent versions of minecraft. Since people who post Google answers don't know the games, they also don't know when the game changes, let alone if those changes invalidate their answers. Points 1-3 originally written by Powerlord. Any answer can be wrong. This is what downvotes are for. The bigger concern is users who blindly vote and/or accept without checking the answer. I'm no legal expert, but anyone should be able to rewrite the relevant information and cite the site(ha!). If this is done in a manner that makes the answer bad, that is what downvotes are for. Games are updated on a regular basis. Answer rot is a valid concern, but "Google answers" are not the only source. My answer to a Terraria question was rendered incorrect by a recent patch. I play Terraria (ask John and Tristan) and wrote that answer from experience. By the time this had changed, I had completely forgotten that I answered that question. It wasn't until someone pointed out to me that the answer was outdated that I did anything about it. I saw that there were already other correct answers, so I deleted my answer. Therefore, (correct) "Google answers" are not a problem. They fall victim to the same pitfalls that any source can. If anything, it is the way inexperienced (or sometimes experienced) users react to answers that is the problem. From a moderator's perspective, incorrect answers are not subject of moderation, typically. So long as it is an answer, all that we really can do is downvote like any other human being. If you do find a question with an accepted but incorrect answer, just post a new one! It happens all the time and having Google as your source of information does not matter here. I do have one exception on record, but that was due to an incorrect, "joke" answer with a massive amount of votes that couldn't be fixed while keeping the joke and that the author was not interested in fixing, and well, exception handling is the core of what moderators do. If you're copying content, you're copying content and there's nothing googling has to do with it. If you find plagarized content, please flag it for moderator attention and we'll take care of it. Don't plagarize. If you find something amazing on the internet, consider writing a summary in your own words explaining the core of the matter and then link to it. If you must, quote, but keep it short and sweet. Since people who post Google answers don't know the games, they also don't know when the game changes, let alone if those changes invalidate their answers. Information rot is something that does concern me, and I have an outstanding feature request that should help in this regard. That said, I do have a number of rotten Minecraft answers. I've played the game, I've occasionally sourced my answers with other resourced (Minecraft wiki on top), I try to keep up to date with what's changing, but... I have written, what, 70-odd answers on this game in the course of the last year and a half? I can't remember each and every one of them, and going back to look at every answer of mine to see if it's aged well is... well... it's not the kind of "fun-sized unit of work" this site works on. It's capital-W work, and one I've been slacking off from. Bad badp, bad! I see this as a problem in the system, and certainly it worries me. I believe anonymous feedback can be an important signal for identifying rotten content, hence my feature request. At the end of the day, though. Just because you googled your answer, it doesn't mean it's more likely to rot. This depends entirely on the game at hand. In general, information rot is perhaps the biggest challenge Stack Exchange as a whole faces right now. In my humble opinion, it's a system-level issue in need, right now, of a system-level answer. If a question can be easily answered by Google, don't just stop at the first hit. Dig deeper, look into the matter, do some science. Write something original, show us the money. If a question can't be easily answered by Google, yet you managed to (likely, the asker is using the wrong terms), there's really no shame in answering with search guidance. You're genuinely helping the community, you're genuinely helping Google and you're genuinely making the internet a better place to be. So no, I really can't bring myself to say "stop Googling your answers dammit!" Typically, we can tell when an answer is a cheap rip off from Google (if you have suspicions, just select the text, right click and search it on Google itself!) and the answer will be voted accordingly. Generally, sourcing your answers is a great thing to do. If you feel the community is upvoting a specific incorrect answer, post your own, talk about it on chat and let us know. If this answer has too many votes to be brought back in its place, poke us and we'll try to right the wrong, somehow, hopefully. If you feel an user is engaging in copyright infringment, bring proof. What did he copy from what? We take this kind of stuff pretty seriously. If you feel a contest is bringing people to post about games they haven't played, the issue probably is more with the contest rather than the user. Talk about this specific thing on meta. Mark Trapp and tzenes both appear frequently in the query Raven links (or by total) in his answer. Both are known for in-depth and high-quality answers, including much research and expert knowledge. It doesn't make sense to say that this query implies something negative about those (in this case, agent86, not that I have any problems with Raven, LP_MF, yx, or Kevin's answers) who share their company. 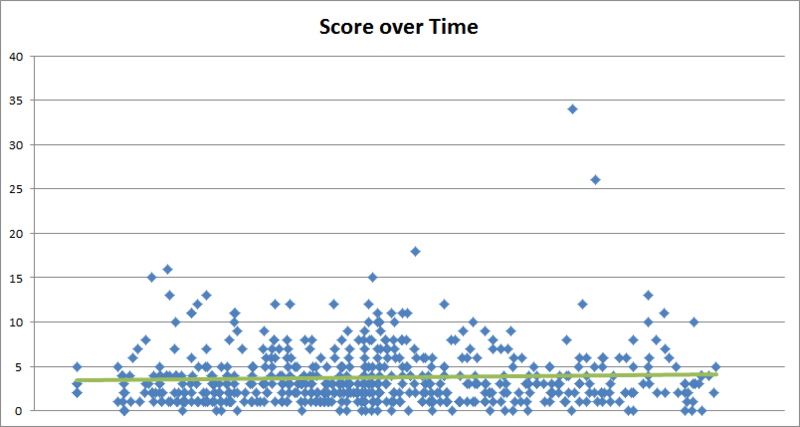 I cut out one answer with 137 score to prevent compression of the graph, but its affect on the trend line was not noticeable. As you can see, the slope of the trend line is very slight and essentially meaningless. His first answers are just as recognized via votes as his new ones. You can argue that old answers have had more time to get votes, but think about how long questions usually remain active and visible. Regardless, jumping from that argument to "he's getting blind upvotes" is completely ridiculous. It might be true, but it's completely unsupportable with fact, and going by the facts we do have (actually looking at his posts and evaluating them) I think I can safely say that by and large he earns his votes. I don't really understand what Powerlord's problem was, and it's not fun to see an active user leave, but I think we ought to stop singling agent86 out immediately. It's simply inappropriate, and I think especially so given the election (users who can't follow all of this may just see controversy and get a negative impression). I applaud Sterno for making the question neutral and focusing on site issues instead of Powerlord and agent86; let's follow that example, please. Blind upvotes might be an issue for SE and Googled answers may have issues; I don't dispute that. I'm all for being circumspect with votes and properly evaluating and writing answers. I think that's all we need to do, though. I don't pay much heed to the argument that there is no guarantee that Googled answers are right, simply because there is no guarantee that any answer, Googled or otherwise, is right. Incorrect answers that receive upvotes are a problem, but I don't think Google is the cause. As far as the specific example of copying content and GameFAQs in particular, my experience as a reader and contributor to GameFAQs is exactly the opposite... most authors don't mind if you copy their work so long as you aren't trying to make money off it. And most FAQs I've read have specifically stated if someone had a problem with it. But that specific example aside, I don't know enough about this issue to know if legally it's a real problem or not. When it comes to answer rot, every answer risks suffering from answer rot. Googling aside, does this mean I shouldn't leave an answer on the site if I don't think I'll be around a month, year, or decade from now to correct it myself? Am I responsible for maintaining and updating every answer I leave, for all of time? There are already tools in place to combat this problem. If someone literally knows nothing about the game and slaps the first thing they find on Google as an answer, then yes, that can be a problem, particularly if what they cut & paste looks good, which will tend to give it upvotes, correct or not. But how often is this really the case? I've answered quite a few SWTOR questions that were a combination of my personal experience with the game along with researched (a.k.a., Googled) knowledge. So I think this is definitely a problem if the answerer doesn't have enough experience to even know if the answer is correct or not, but again, that's what downvotes are for. What other alternative do we have? Reject correct answers because we don't like their source?. For me, the issue really comes down to whether or not the answer is correct and well-written, not where it came from. The community has tools in place to deal with out of date answers and incorrect answers, regardless of their source. And lastly, if SE has a policy against Googled answers, how exactly does one police that? Short of an extremely obvious cut & paste job, there's no way to know whether an answer was Googled or not. What are the qualifications required to post an answer on Gaming.SE? A willingness to accept the consequences if you are incorrect. A willingness to revisit answers over time so that they don't become stale. A willingness to accept that a better answer may come along later. These are important - no doubt. But I feel like if we made them "primary" we'd exclude many "drive-by answerers" with little to no rep from the site. However, as "power contributors" we acknowledge these things are part of our responsibility. Plagiarism or copyright violations are a different topic. I don't condone copyright violations in any form, and I encourage everyone to be extra careful about this sort of thing. Don't get me wrong - these things can improve answers. They are not guaranteed to, but in most cases they do. However, as a criteria for judging answers, I find this problematic. How do we evaluate this? Should each answerer be asked to prove that they've played the game in question? How long ago should they have played it? What if they played it for a while, but don't anymore? What if they haven't bought all the DLC, and maybe one of the DLC packs makes a difference? What if they just played the demo, or read a review that covered this topic? Is watching a 2-hour Let's Play or a Speedrun enough? What if they played the game, but had to look this particular question up? What if they've played a bunch of games in the series, but not this one, is that enough to form a basis to provide an answer? What did they know before they read the question, versus what they had to go and do research to determine? In short, how are we to evaluate this person's qualifications to answer, if we're going to filter 'good answers' from 'bad answers' and vote based on what we believe their level of personal expertise is? What I see happening now is, if a post cites sources, especially multiple sources, or it answers the question but doesn't provide tons of specific/irrelevant details, people are assuming a lack of personal experience, and they're downvoting answers and taking the answerer to task over this. The problem is, citing references should be a way to improve an answer. Giving as much information as the asker needs should form the basis for a "good" answer. There is certainly a continuum of answers possible to a question, and some are better than others. The core systems of the SE network are designed to handle this situation. Not doing this, I think, is why people get annoyed with the "Googled" answers: they're kind of thoughtless and in some ways condescending: "eh, you could've spent 30 seconds Googling it yourself like I did and answered your own question. Dummy." I wish the people who do go for the Googled answers assumed good faith more often, or assumed the original poster isn't completely incompetent and already considered the obvious answer. If the answer was so easy to find, why was the question asked at all? I don't really know why people don't do that more often: I think maybe—given some of the contests we've had recently—people think a fast answer is better than a thoughtful one. For urgent situations, yeah, I suppose that's true. But gaming is a recreational activity: it's not mission critical for most people. And what sets Gaming.SE apart from our competitors—stuff like GameFAQs's answers board and Yahoo! Answers—is the level of thought and science we put into our best answers. We should be emphasizing—and insisting—on that level of quality for all our answers, not just a small subset. So right isn't the bar we want to hit: useful is. Did the internet just get a bit better with an answer? Will someone see that answer, having read the content on GameFAQs or Yahoo! Answers, and say "wow, that's interesting!"? If not, and all we're doing is shuffling bits around between the dozen or so gaming help sites by copying answers, is all this really worth it? I don't see any fundamental problem with answers that rely on external sources instead of personal experience. That's probably not a big surprise as I'm moderating an SE site that is all about finding reliable external sources. The important part when your answer is not based on direct personal experience is to judge the reliability of your sources. An official answer from a developer is obviously a very good source, a random forum post might be accurate, but it's not reliable by any means. A wiki that is used by a large number of players tends to be pretty accurate, though there is still the danger that it has become outdated. One very important aspect of creating a trustworthy answer is making it easy to follow or reproduce the answer. Answers that explain how they got to their conclusions are just far more useful than answers that are just statements without any explanations how the user arrived at that knowledge. The exception are answers that are directly and easily verifiable ingame, voting works very well on those and they get quickly corrected if they're wrong. It is very unfortunate that this issue was brought up tied to one specific user, relying on external sources is really a widespread practise on this site. My subjective impression is that a large number of answers is directly or indirectly based on external sources, not direct personal experience. Many answers quote some wiki directly, or the users are writing answers based on something they read a while ago, but never independently verified themselves. The answer should indicate where the information is from, this allows readers to judge the reliability themselves by examining the sources. It should not be based on the first result you can find, but if possible on multiple independent sources. Not the answer you're looking for? Browse other questions tagged discussion answers allowed-answers . Do we need a “General Reference” close reason? If I got a correct answer for an identify-this-game question, should I fix the question?